The AIRAID 201-103 fits some Chevrolet C2500, Chevrolet C2500 Suburban, Chevrolet C3500, Chevrolet C3500HD, Chevrolet K2500, Chevrolet K2500 Suburban, Chevrolet K3500, GMC C2500, GMC C2500 Suburban, GMC C3500, GMC K2500, GMC K2500 Suburban, and GMC K3500 models. See vehicle applications for details. The AIRAID Classic Performance Air Intake produces more horsepower and acceleration from your engine by replacing the factory air intake tubing and air filter assembly with a low-restriction, high air flow induction system. The restrictive factory paper filter and air box are removed in order to mount a new AIRAID premium air filter in the original air box location. The addition of a powder-coated steel intake tube further increases air flow boosting torque at the drop of the throttle. The intake tube also accommodates the vehicle’s factory emissions control devices such as the mass airflow sensor and breather/vacuum hoses where applicable. The 360-degree conical AIRAID premium air filter is washable and reusable, less restrictive than traditional paper, and assures superior filtration. 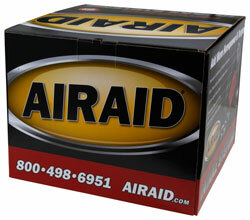 The AIRAID Classic Performance Air Intake is easy to install with common hand tools. Some AIRAID air intakes are not legal for sale or use in California and other states adopting California emission standards, while others are 50 state legal. View the product's vehicle applications to determine the legal status for each vehicle.